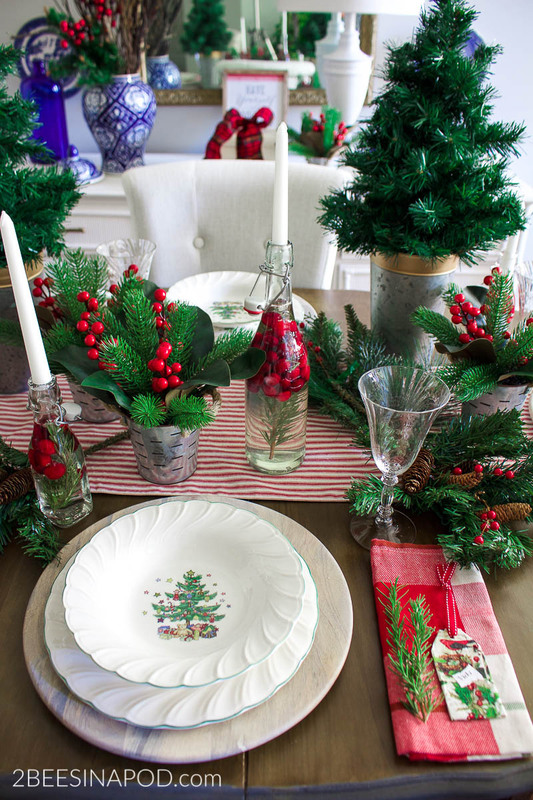 You can never go wrong with a classic red and green Christmas tablescape. 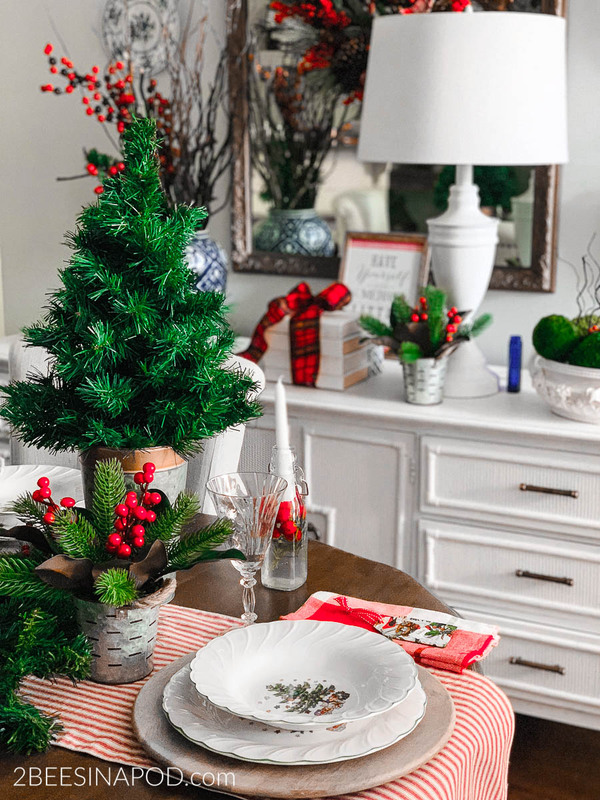 This week I’m excited to join Angie of Postcards from the Ridge and 24 of my home decor design friends for a Christmas Ideas Tour. 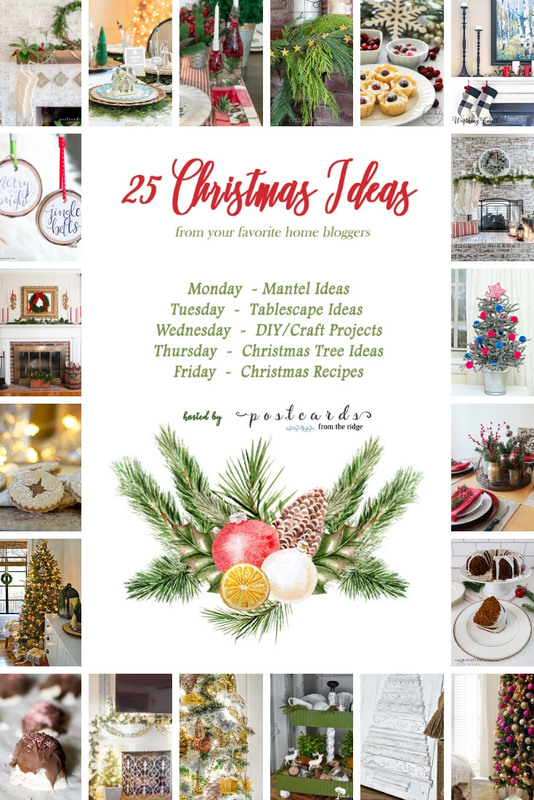 We are each sharing our Christmas decorating ideas all this week. 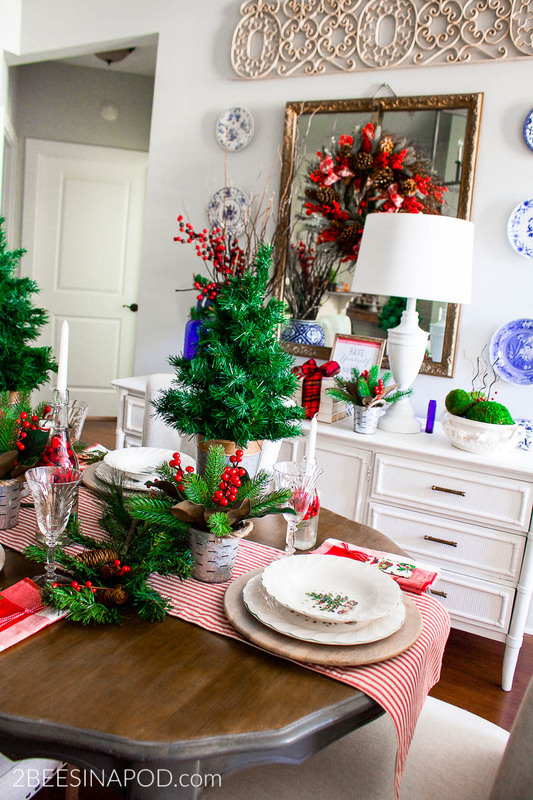 Mantels, DIY projects, recipes and trees. Make sure to see and visit all of the inspiration at the bottom of this post. 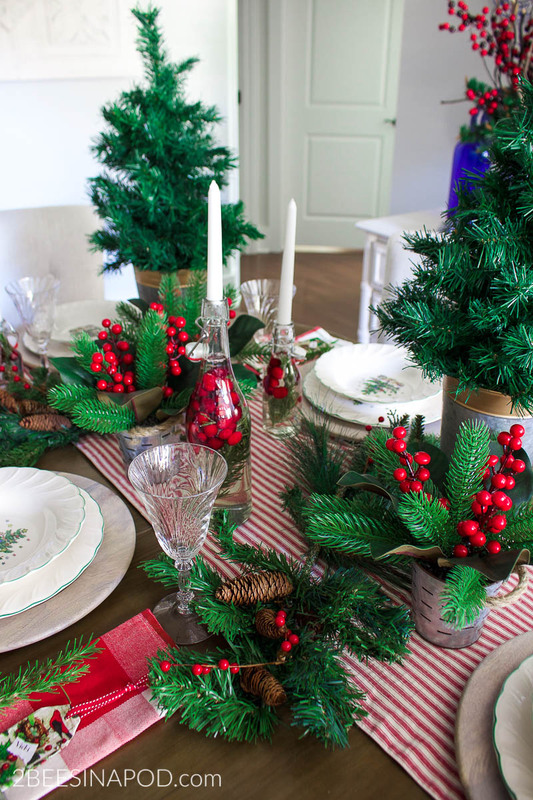 Today is all about Christmas tablescapes. 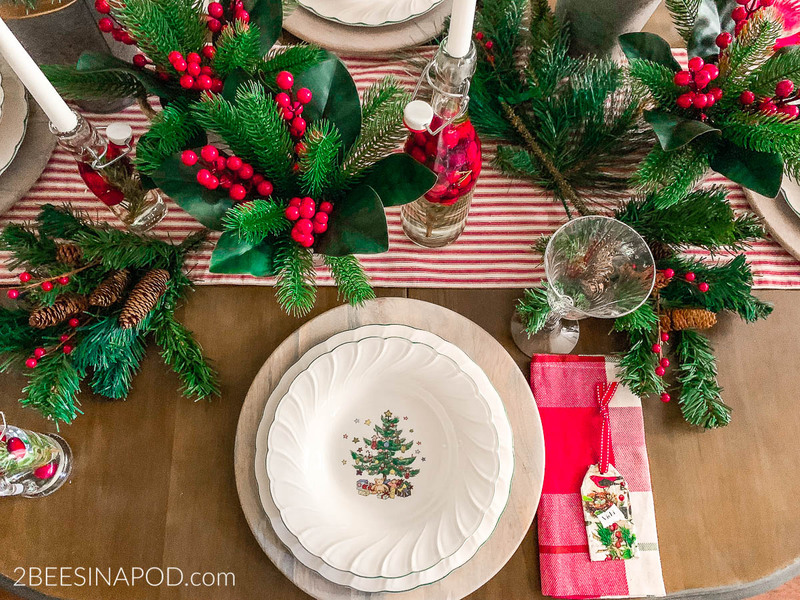 I’m kicking it old-school and sharing my classic red and green Christmas tablescape. 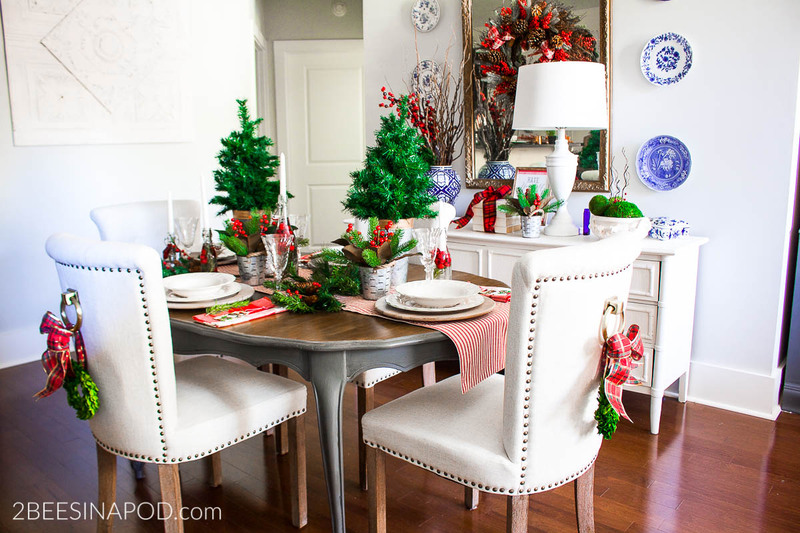 Every Christmas season I have decorated my home differently each year. Even my tablescapes have changed through the years. Last year I created a Christmas Village Tablescape. The year before that was a Rustic Christmas Tablescape. This year most of my Christmas home is decorated in red and green plaid. I was feeling the need for color as well as feeling a bit nostalgic for the Christmases of my youth. This is the first Christmas that I have decorated the dining room since the budget friendly dining room makeover earlier this year. I didn’t feel the need to remove any of my blue and white chinoiserie or decor from the dining room. Bits of red and green are added on the sideboard and into existing decor. I decorated the dining room chairsbacks with wreaths and plaid ribbon. Instead of using candlesticks from my stash, I decided to be a bit more creative. About 10 years ago I used this idea for a Christmas luncheon in my home. I’ll be sharing more of this easy DIY later this week. Another easy DIY project are these super cute place cards. They can also be used as gift tags or ornaments. I will be sharing this project as well. This Christmas china pattern is appropriately named “Happy Holidays”. My mother-in-law gifted the set of 12 to me the first Christmas that Honey Bee and I were married. Needless to say, I cherish it and the memories these dishes hold. 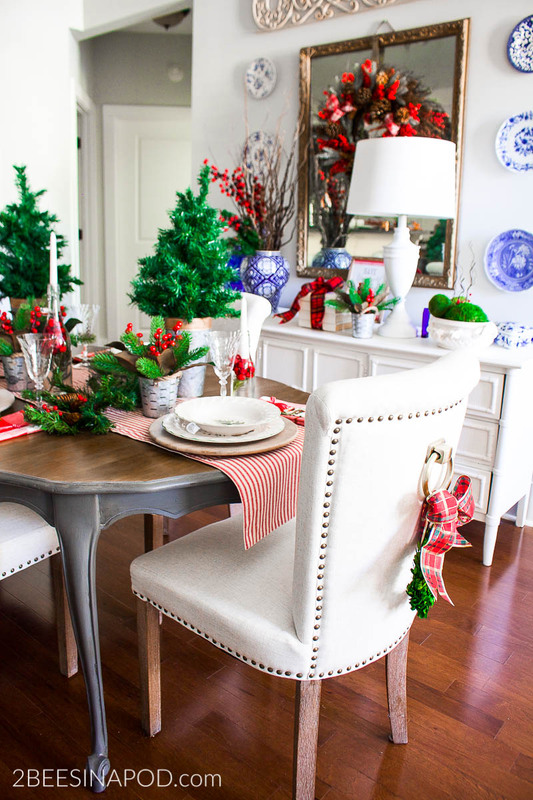 The idea for this tablescape came together when I placed the red and white striped table-runner on the table. It sort of reminds me of a candy cane. The only new purchase are these fabulous mini olive buckets with greenery and red berries. They were only $4 each and I was smitten the moment I saw them. I adore greenery that doesn’t look faux. Picks were added around the center of the table. 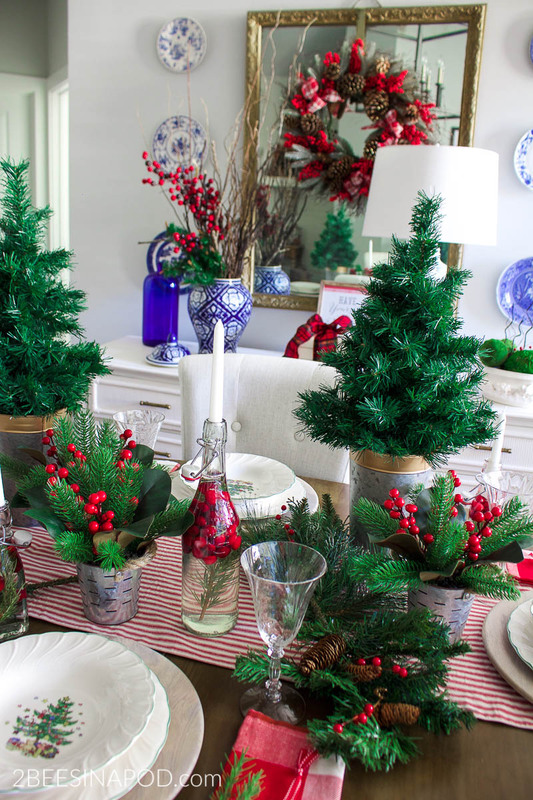 The miniature Christmas trees are a great addition to the table too. Doesn’t this look like fresh greenery? Classic red and green is always a Christmastime favorite. Now I’m ready to host our family for Christmas dinner! I’ll be sharing everyone’s ideas on our facebook page and also on instagram, so follow along there to be sure you don’t miss any of them. 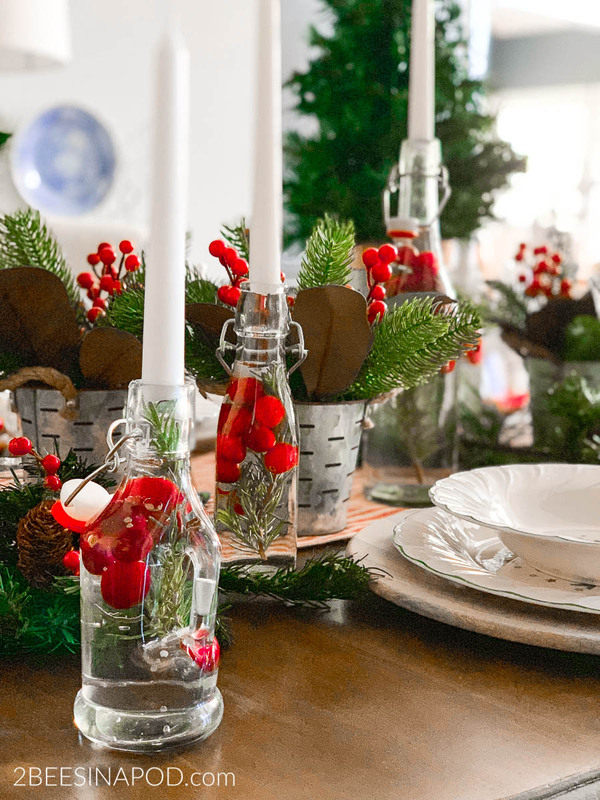 Now it’s time to see all the Christmas ideas from these talented home bloggers. Here’s the tour lineup for the week. Be sure to visit everyone for wonderful Christmas ideas for the whole house. The links for each topic are below the images. What a beautiful table! I love the candle holders you created with filled bottles. They look so pretty and I’ll bet that at night they really glow. I am looking forward to learning how you made these and also how you made your cute place cards. 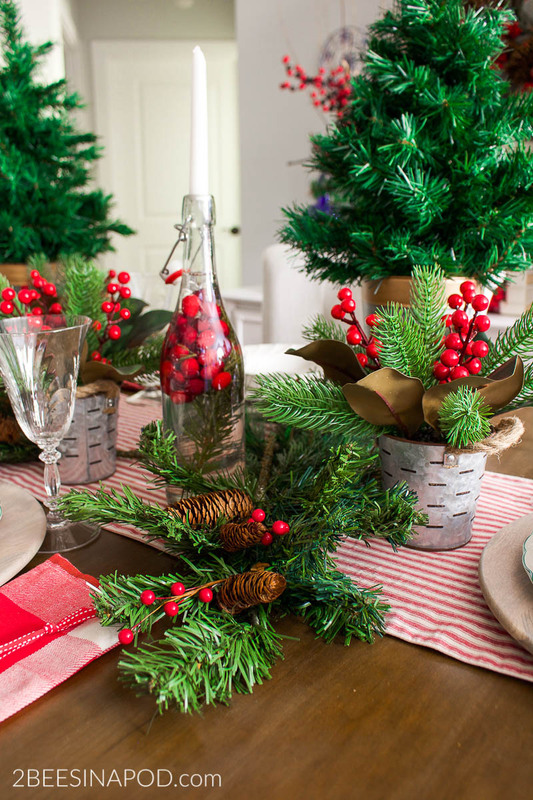 Your red and green table is so cozy and festive! 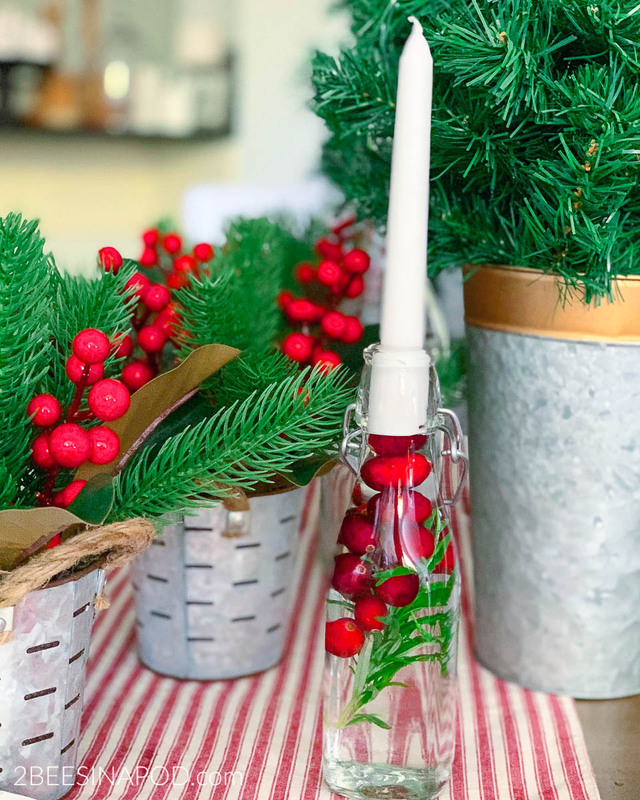 I love the clever candleholders and those little olive buckets are adorable. The striped table runner is the perfect base for all of it. Thanks for joining the tour! Gorgeous! I love that you decorated the ring backs of your chairs. That might just be my favorite part! I love the red and white ticking runner; so fresh and crisp! Your bottles with the candles are awesome; love that idea. Pinned! It’s so bright and merry!!! 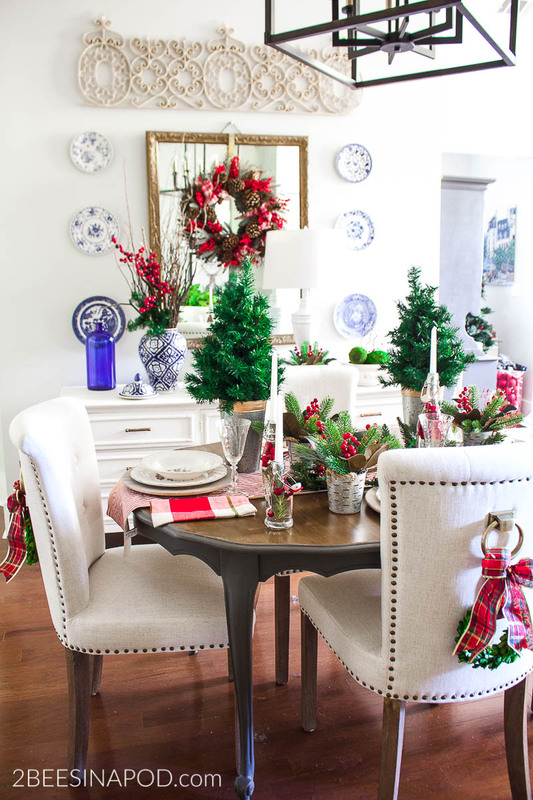 I love how you hung the wreaths on the chair backs, and I think your blue looks gorgeous with the traditional Christmas colors!! Oh yes! Plaid is where it’s at! I love all the plaid, stripes and pops of red! Adore! 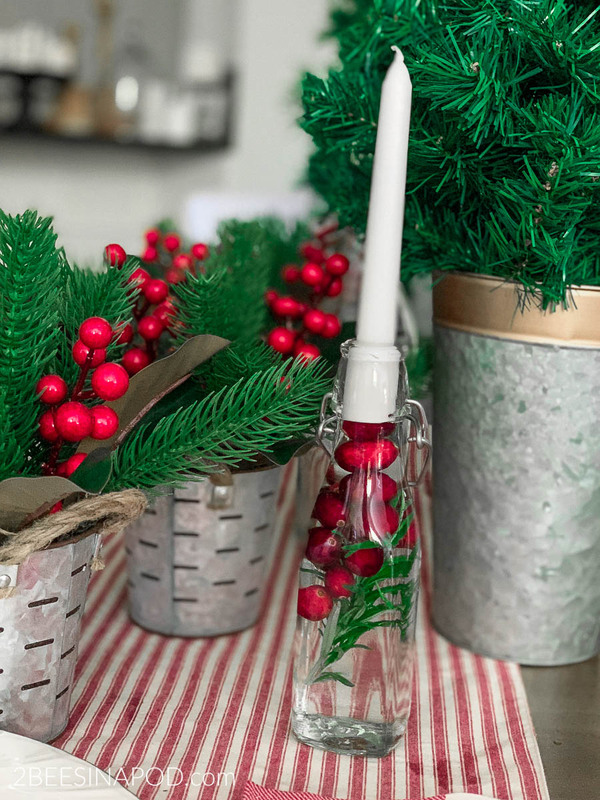 Your table is Merry and Bright. Perfect for the season. Love those chairs with the rings on the back. I’ve never seen anything like it. Great for adding a little decorative touch. Those place card tags are so pretty too. Great job. So festive!!! Love all the red and green & those berries are beautiful!!! 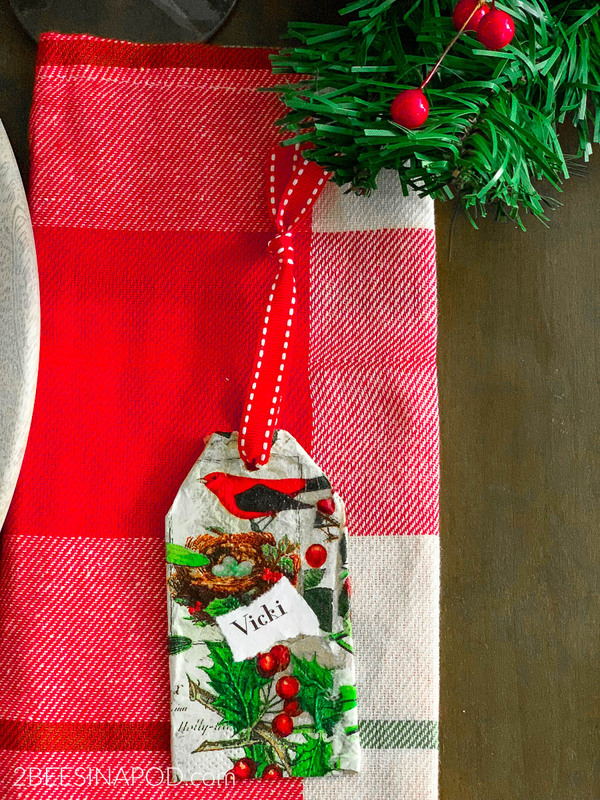 The bold red and green is so beautiful … and I LOVE those vintage style place cards! So true…you can’t beat green and red…with pops of lovely Blue Willow in the background! Just so fresh and classic. Love those candle holders too! And eager to see how you did that placecard/gift tag. I love your classic tablescape! The red berries really pop and how awesome that you didn’t have to remove any of your pretty blue and white accessories!